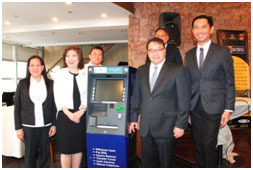 More than a thousand automated teller machines (ATM) nationwide are now hailed as the first “GREEN ATMs”. (L-R) OMMC ULAB Supervisor Rita Regalado; ALKFI Managing Director Clarissa Ocampo; OMMC ULAB Manager Francis Isip; RCBC Senior Executive Vice-President Redentor Bancod (back); RCBC President & CEO Lorenzo Tan and; RCBC Vice-President for Corporate Communications Jose Edwiniel Guilas pose with a sample of RCBC Green ATM machine. (L-R) Oriental & Motolite Marketing Corp. (OMMC) ULAB Manager Francis Isip; ALKFI Managing Director Clarissa Ocampo; RCBC President & CEO Lorenzo Tan; RCBC Senior Executive Vice-President Redentor Bancod; RCBC Vice-President for Corporate Communications Jose Edwiniel Guilas and; OMMC ULAB Supervisor Rita Regalado during the launching of First Green ATMs in the country. ABS-CBN Lingkod Kapamilya Foundation, Inc. (ALKFI) and Rizal Commercial Banking Corporation (RCBC) sealed an agreement to properly dispose used lead acid batteries inside ATM machines. ALKFI’s Bantay Baterya Project has a long standing partnership with Oriental & Motolite Marketing Corporation (OMMC) in ensuring the proper disposal of used lead acid batteries. OMMC, through Evergreen Environmental Resources, Inc., will collect all the used batteries from 1,100 RCBC ATM machines and 422 bank branches and offices nationwide. Proceeds from this endeavor will be used to further develop Bantay Kalikasan’s ecotourism sites in the areas of MIMAROPA islands, Masbate and Sorsogon in Bicol and Saranggani Province in Mindanao. RCBC President & CEO Lorenzo Tan shared the endeavors of the bank on becoming green and on strengthening electronic transactions in the halls of RCBC offices to reduce paper consumption. “I hope we can encourage the other banks and other corporations in the Philippines to join this endeavor. There are lots of recyclable materials inculding bateries that we can gather and put into more productive used,” Tan stressed. ALKFI Managing Director Clarissa Ocampo notes that this endeavor can later be expanded into other relationships, so it is important to have partners like RCBC to implement our advocacies. To know more about donation of used lead acid batteries, visit Bantay Baterya and Bantay Langis or call 4152272 local 3742 or 4512227.